I am working with a brilliant first grade teacher during her writing workshop. Mrs. B.’s writing workshop runs like a well-oiled machine and is the kind of workshop you read about in professional books. When Mrs. B. approached me for a coaching cycle, I wasn’t surprised. She is the kind of teacher who is always looking to refine her craft. Mrs. B. wanted to improve her writing conferences with kids. We are using Carl Anderson’s book, How’s It Going? A Practical Guide to Conferring with Student Writers to guide our learning. In Chapter 3, Carl writes about the importance of teaching students their role in a writing conference. He recommends several minilessons to help students understand their conference roles. After we discussed each of these observations, Mrs. B. and I modeled a non-example of a conference. Mrs. B. played the role of an inattentive, unprepared student who barely talked about her writing. The first graders immediately noticed the difference and were quite amused by this “student” who was not taking her writing seriously! With this minilesson in mind, we sent the kids off to write while we conferred individually with several writers. Mrs. B. and I knew we wanted to teach into the chart; we wanted to capitalize on their observations and build on them. We decided to turn their observations into learning targets. For example, our next minilesson centered on the idea that “I can talk a lot about my writing.” We spent a few days exploring this idea. What does it sound like when a writer talks a lot about their writing? Mrs. B. modeled this kind of talk for them using her own writing. They practiced talking a lot about their writing with a partner. We even videotaped Mrs. B. conferring with a student during writing time, and we used the recording as the minilesson for the next day. “Wow! Listen to Charlotte talk a lot about her writing!” we said to the kids. We also turned the last observation on the chart into a minilesson. “I can try what my teacher teaches me right away” became our next learning target. We told the students that during a writing conference, the teacher will teach them something about writing, and it is their job to try that thing right away. “For example,” we said, “yesterday we taught Joshua that writers of informational books sometimes use pictures to explain an idea to their readers. Today, Joshua is going to try to do that in his writing. We’ll check back in with him during our reflection time to see how he tried it right away.” Sure enough, during reflection time Joshua proudly shared his illustrations showing the differences between gorillas and monkeys. Mrs. B. and I are both pleased with how her students are taking ownership for their own learning during writing conferences. We have noticed they are talking about their writing more than they ever have before. They are eagerly trying our teaching points as we walk away from a conference. 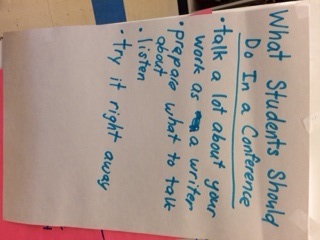 These students know they have an important role in a writing conference. Such great reminders. We do have to set up our examples as well as show again and again. The fish bowl is a technique I know about, but don’t utilize and need to add to my repertoire. Thanks for the encouragement. This was so great for me to read. Conferring is my weak link and one I work every year to improve. When I read about how it works for other people, I always get something out of it. I have an annual creed “Model Everything, Assume Nothing” –Cambourne. 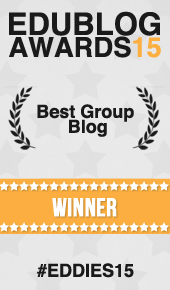 Great post and great ideas shared here Dana! Defining roles within the conference is really important and this reminded me I may not be doing that enough within my own workshop. It is something that needs to be revisited often, especially with the littlest writers. You wrote something VERY important here (well, lots of important things, but one I wanted to make note of here)! It takes SEVERAL rounds of teaching kids how to “do” conferences before they get good at it. We cannot expect kids to understand their role completely after just one minilesson or one fishbowl of a conference. We have to model it and let them see conferences in action lots of times if they’re going to get good at it. You and Mrs. B. are doing wonderful work! Keep it up. This is so helpful. I love the specificity of the post. I feel like i was there. I have done role playing with teachers and with their students as a way to show a class what might be. The shift from modeling to learning targets for grade 1 seems smart and doable. What a great post! I love the collaboration between coach and teacher and how you transformed the student observations into learning targets. We just had a Wonder Walk (sort of a Learning Walk) at our school, and some of the data gathering involved interviewing students about their writing. When students were asked about their writing, their initial response was to share what they were writing about (the subject) rather than how they were writing about it. We had to probe a bit more to get the information we were looking for. I think teaching students explicitly how to share their writing is a really important step. I am printing this post out –it’s a keeper! This post really gave me an “Aha!” moment. I never thought about teaching students they have a role in a conference! I’ve been teaching kindergarten for 10 years and just moved to third grade this year. In kindergarten, so much of writing workshop for me centered around teaching them they have many ideas and stories to share and then trying to help them understand how to take sounds and put them into letters and words and sentences. Conferring did not feel neat and orderly in kindergarten. I am impressed that first graders are able to talk about their writing, but I see that you have taught INTO that with the classroom teacher and videotaping a classmate was a fantastic idea. This shows how amazing collaboration can be between coach and teacher and how that can raise the level of achievement in the classroom. I would be interested in some of the ways you said writers can talk about their writing. Also, I sometimes find it hard to have a teaching point ready to go to match what the writer is doing. This could be because third grade writing is new and different for me and I am unfamiliar with teaching certain genres. Our current unit is persuasive speech writing. How do you help teachers organize the possibility of teaching points that could be matched to what students are doing? Did you pull students who needed similar teaching points to make a small group? Great post to get my wheels turning on ways to be more strategic and explicit. Thanks! Katherine, thank you for such a thoughtful comment. I’m really excited about this work we’re doing in Mrs. B.’s room. I will think more about your questions about finding a teaching point and blog about that in an upcoming post. We have a great Blog Series coming your way next week which will also address some of your questions!